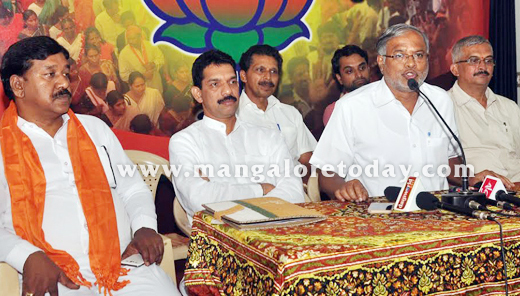 Mangaluru, May 16, 2015: Briefing the media May 15, Friday, former BJP minister Suresh Kumar has said the Congress-led State government will get "poor marks" even with the grace marks given by the people of the State at the end of the five-year term. He condemned the Congress State government for failing to take up development programmes suitably in the State even after two years in office. The people of the State are disappointed with the performance of the government. The State government, as well as, its cabinet ministers have become inactive, he said. The State government must get their act together and work for the progress of the people. He blasted the State government led by Chief Minister Siddaramaiah for taking away the right to life of poor families by demolishing their properties constructed 30 years ago in Bengaluru. Referring to Ugrappa’s statement that he would move a privilege motion against MLAs H D Kumaraswamy and Suresh Kumar (members of House committee) for making public proceedings of the committee, the former minister said "Ugrappa is my friend. He has forgotten his days during his fight against emergency. For the sake of the people, I am ready to accept privilege motion and go to jail if need be," He attacked the government for carrying out the demolition drive even before the House Committee report was furnished. He went on to say that, Home Minister K J George failed to maintain law and order in the State. In fact, he has failed to protect the interest of the people of his own constituency where the demolition drive was taken up. He visited his own constituency after several days of the demolition drive and said that my constituency did not have lake and the demolition was wrong. In the context of gram panchayat polls, the State BJP is organising party workers convention in each assembly constituency. 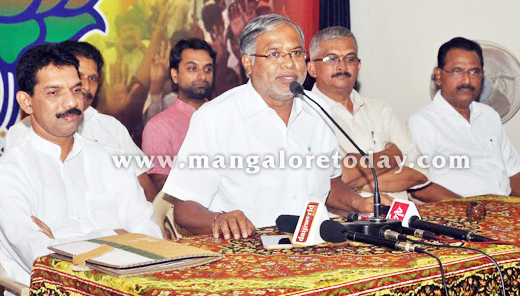 A convention was held at Belthangady and Moodbidri on May 15, Friday. Union Minister for Chemicals and Fertiliser Ananth Kumar will visit the district on May 17, Saturday. He expressed the voters will elect good and able candidates during the gram panchayat elections due soon.